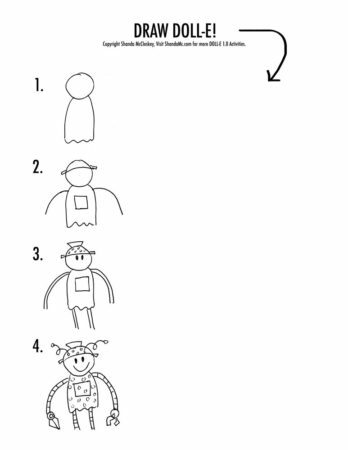 Learn to draw Doll-E and Blutooth characters from my new book, DOLL-E 1.0! Just print and enjoy! Happy drawing! I got an agent! – Very good. I got LASIK – Very very bad. My life changed on February 19, 2016. Because I had LASIK. Yep. That “easy” surgery that’s a “miracle” called LASIK. Well, for most it is a miracle, but it was a tragedy for me. I haven’t even been able to write about it until now – over a year later – and I’m still not out of the woods. My eyes reacted unpredictably to the surgery, probably because of unknown underlying auto immunity in my body. My eyes were so dry for months, I could barely open them and when I did, the vision was a blurry mess. I can’t think of much worse for an artist aside of losing your drawing hand. Then as I was just starting to see some improvement in my sight, I suddenly was afflicted with HUNDREDS of floaters in my eyes that swirled around (and still do) at every eye movement. I had developed uveitis which in my case is a chronic auto-immune inflammation of the uvea in the eyes. Without steroids, I would eventually go blind. But steroids have their own issues. As months passed, my clarity improved but it’ll never be as sharp as it once was before the surgery. I’ve seen so many eye doctors. And now I have developed cataracts from the steroids. And that’s where I stand now. My vision is starting to cloud up. Hopefully I can remove the cataracts safely with another surgery soon. And I’m hopeful that after that, I can be well enough to undergo a last surgery to remove the many many floaters. From this, I sprouted some scary anxiety that on one occasion landed me at the hospital. Anti-anxiety medicine was a life line, literally. And I’m still very reliant on it as I continue this health journey. The bad news is that I gained 30 pounds since starting this medication, but it’s life (and be bigger for now) or death. Sounds extreme, but it’s true unfortunately. Also Erica held on, encouraged me, and waited for me to get better. I got a book deal! – Very very good. But in the middle of all this tragedy (early this year), something AMAZING happened. Erica submitted my book to a handful of publishers and 4 BIG publishers wanted it! It went to auction and sold to Little, Brown Books for Young Readers in a 2 book deal! A. Dream. Come. True. I can’t even. I did the job! – very very very good. I’m still standing! – very good! I’ve never thought of myself as very strong, but I still can’t believe what I’ve gotten through this past year. Good and bad. I’ll continue to trust the Lord. I’m sure I’ll still mourn my loss of perfect vision for a long time, but I know God will deliver me to the other side of sorrow soon. He has already thrown me many lines of hope that I hold onto with all my strength. I have the sweetest husband ever! – so good. Through this, I’ve seen the love my husband has for me. I knew he loved me before, but I REALLY know now. He carried us when I couldn’t rise from the bed or take care of our girls from depression. He never got angry at me or asked me to “get it together” or “man up” or anything like that. He got it together and manned up in my place. He just loved me. He never lets go of our hope for normalcy again one day. He has tirelessly talked with me over and over reminding me of the hope I have in healing, good doctors, and a career ahead of me. He’s such a good man and daddy. He saved me. So now I’ve finally written this down. Whew. I hope to be posting happy updates soon. Until then, I’ll keep on truckin’. They say the best story is when a character is faced with the most awful thing that could happen to them, and then we see them grow and overcome it. That’s my hope. P.S. 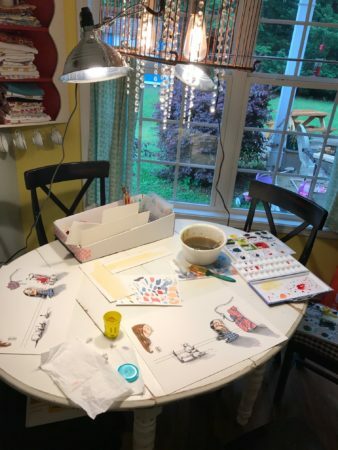 My debut picture book Doll-E 1.0 publishes Spring 2018 by Little, Brown! 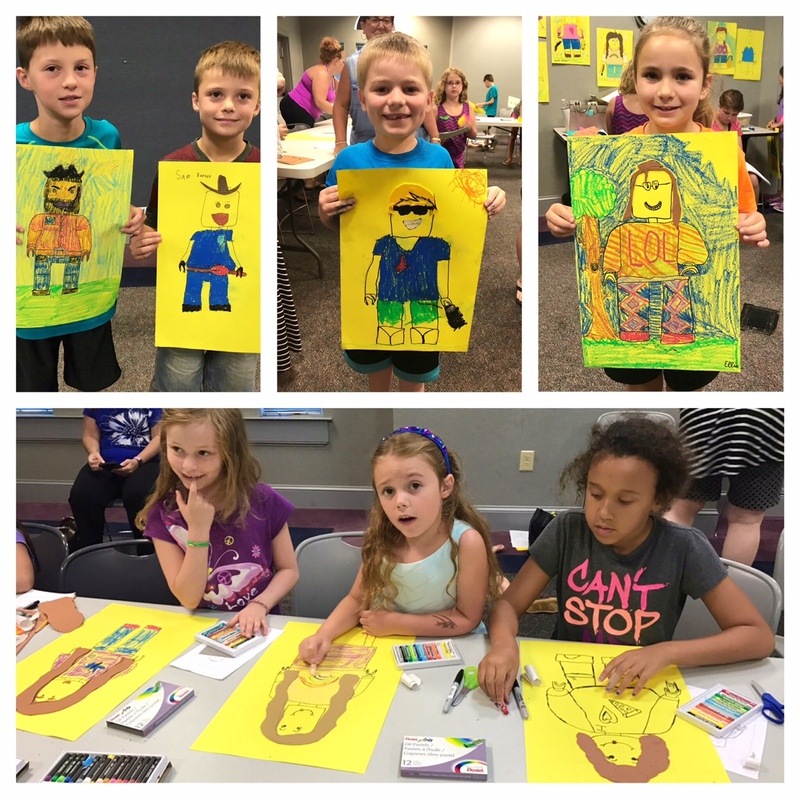 This summer, the Sequoyah Regional Library System’s theme is “Build A Better World”. 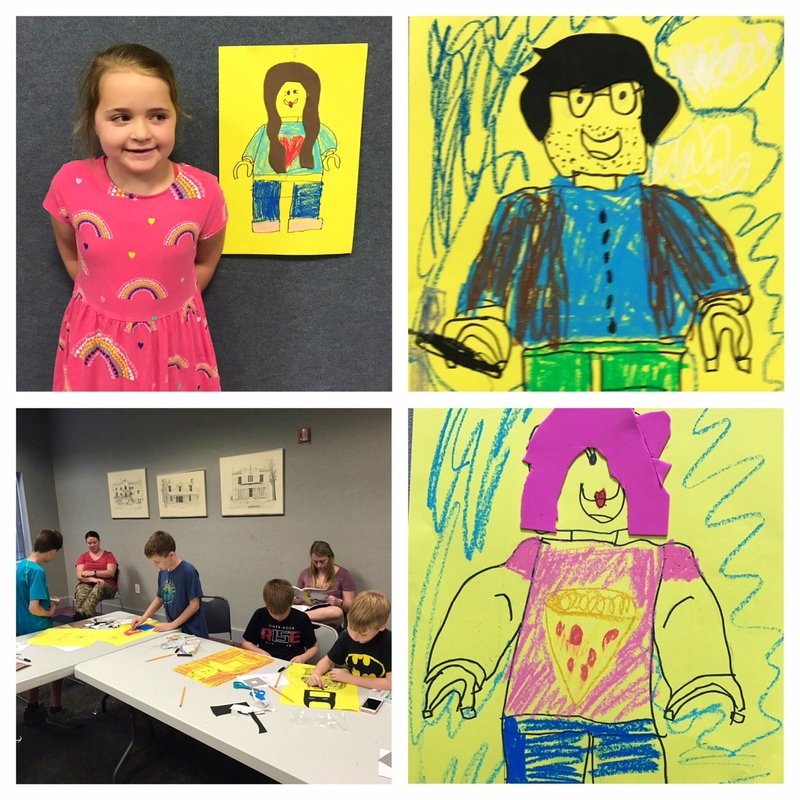 So, yesterday I spent a couple hours at Pickens County Library leading 20 very cool kids through a LEGO self portrait! 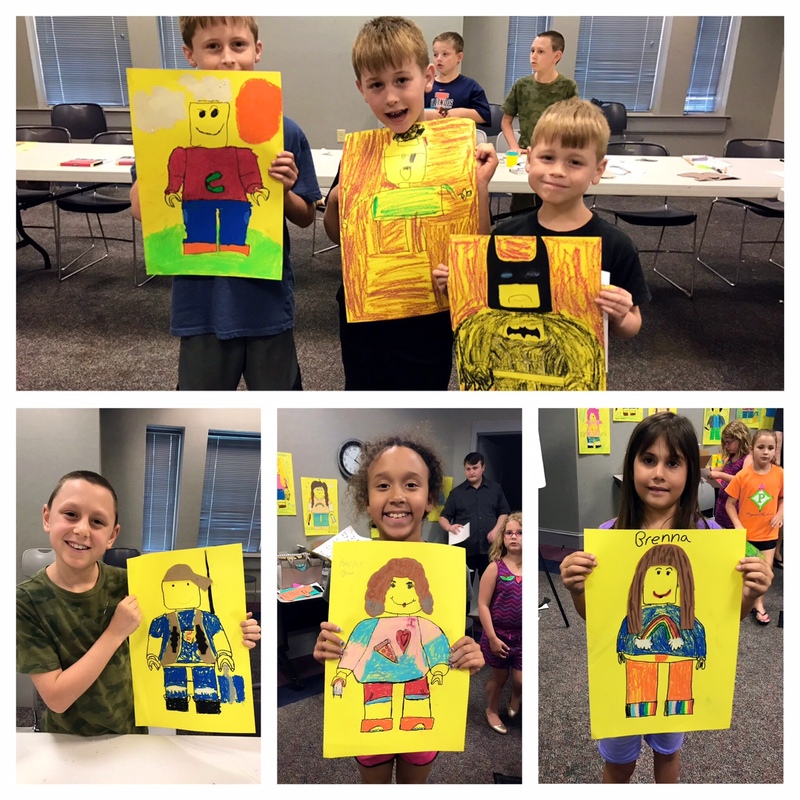 Each one created a totally unique piece. It always lifts me up to spend time with kids! We used a grid technique to draw a large LEGO guy base. It was tough to do, but they mastered it. Then they added adhesive foam hair and details to showcase their personalities. Last, they colored them with oil pastels. I hope the kids had as much fun as I did! I’m thankful for the extra hands I had there too – Barb McCloskey, Ethan Walker, Harvey Jane McCloskey, and Gracie Helton! I’ve recently been facilitating an online drawing course for a high school age home-schooled student (my nephew). One thing that I’ve noticed is that learning to shade and add value to a drawing is difficult. 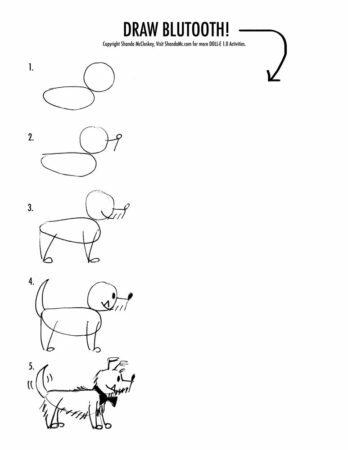 You must learn to SEE it first, then you can draw it. 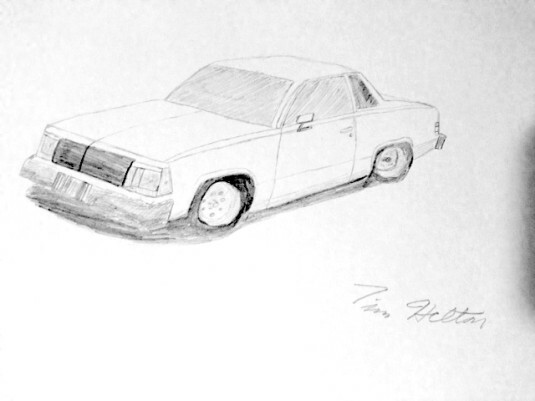 For example, my nephew sent me a drawing of his white car. It’s a nice drawing, but he has left white/blank every area that is painted white in real life, so it appears flat. Even “white” objects have many different greys in real life to show the form. 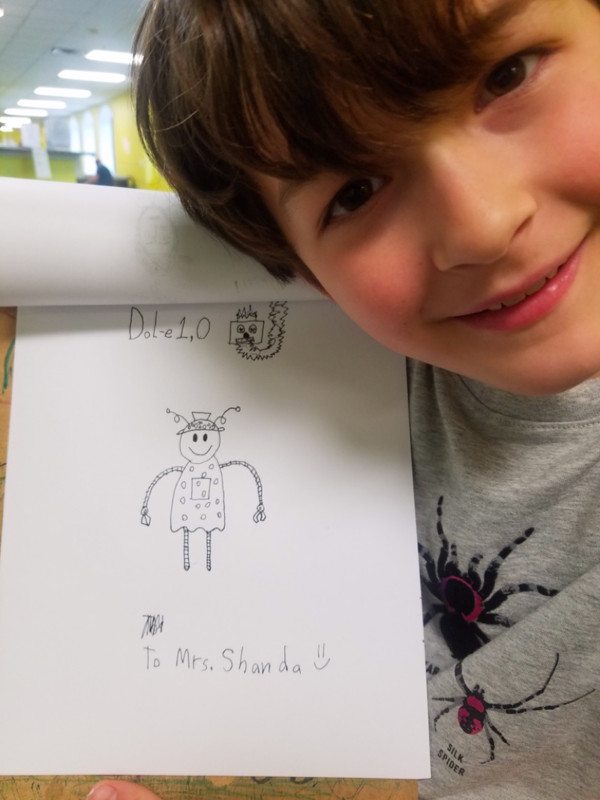 So, I’ve challenged him to draw a white egg! It’s harder than you think! I had to shade, then erase, then shade, then erase, and shade again to get it just where I wanted it- where it matched what I SAW. Give it a try! 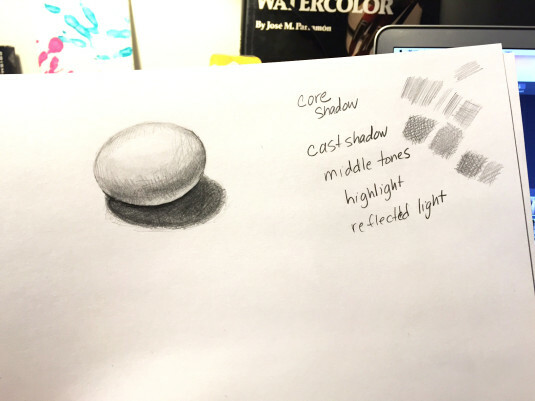 Go draw an egg!